Persis Blake has two lives. In one, she’s the center of high society and the Albion queen’s best friend. In the other, she’s the Wild Poppy, rescuing prisoners of the neighboring kingdom’s revolution. When a refugee connected to the head of the Galatean revolution shows up seeking asylum, Persis can’t help but suspect his motives. Justen, a Galatean medic and scientist, carries a secret with him into exile. One that could provide the Galatean Revolutionaries with an even more powerful weapon. Persis and Justen begin to fall for one another, but there’s just one problem. Their love could jeopardize everything. I bought this book years ago on pure name recognition. I’d been in an email loop for young adult writers with Diana Peterfreund (go TeenLitAuthors!) and her contributions to the group stood out to me as being really helpful. So when I saw this book on the shelf at Barnes & Noble, I was like, hey I like her! And I picked it up. Once I realized it was a story inspired by The Scarlet Pimpernel, one of my favorite classic tales, I was nervous. I mean… I LOVE that story. And I love the movie with Jane Seymour. So I was really worried that I wouldn’t be able to enjoy the story for pointing out things that didn’t translate well into this sci-fi setting. The biggest change of course is the addition of all the sci-fi elements. Instead of Madame Guillotine, we have a drug that causes brain damage. Revolutionaries force this on their imprisoned enemies and treat them as slaves. Within the context of the story, it really translated well. I liked that it raised some big moral questions and still maintained the urgency needed to fuel the Wild Poppy’s action. I loved that Across a Star-swept Sea reversed the gender roles of many of the characters. The point-of-view of each character was really well-done, too. When I was in the POV of a soldier, it felt like being inside a military mind. When I was in Justen’s POV, I watched him break down situations the way a scientist would. When I was in Persis’s POV, I watched her struggle with all the competing parts of her identity. 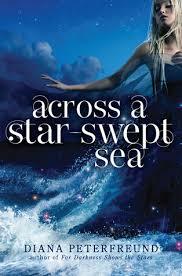 If you liked These Broken Stars, I think you should definitely check out Across a Star-swept Sea. Though it’s the second in a series, I think it’s fine to read as a stand-alone. I do want to go back and read the first book, but I didn’t have any trouble following this book without having read the other one first. I hesitate to compare it to the Lunar Chronicles – both are great, and I highly recommend them. The writing felt different to me, but still really good. But yes. I think if you liked the fairytales-gone-sci-fi elements of Cinder, you’ll probably like Across the Star-swept Sea. A couple of intense kisses. A brief comment stating that some believe a global misfortune is due to the gods taking revenge on humanity for attempting to perfect themselves. There are a couple of quick skirmishes between soldiers, but most of the violence deals more with the use of a weapon which reduces one’s mental capacity. It’s a punishment that revolutionaries use against imprisoned enemies. The story follows discussion about whether there are just instances to use such a weapon. I loved the exploration of this topic and felt like the moral consequences were clearly stated. See violence. A pill contains the ability to reduce one’s mental capabilities. Also, this society has the ability to temporarily supplement or enhance genes to change the way one looks. It’s still fairly new, fairly controversial, but several characters use the technology to create disguises. Tagged Across a Star-swept Sea, Balzer + Bray, Diana Peterfreund, For Darkness Shows the Stars, The Scarlet Pimpernel. Bookmark the permalink. So glad you enjoyed this book! I truly love it; it’s one of my favorites from the last few years!